Henry has died at the age of 47. One of the Isle of Wight Donkey Sanctuary’s most popular residents Henry has died at the age of 47 after suffering a stroke. Henry suffered the stroke on Monday morning, and died in the afternoon with his friend Bullrush and his human carers around him. “Everybody is very, very upset,” the sanctuary said. Born in 1971, the red-roan donkey was a real character. The sanctuary said Henry lived with a degenerative condition in his jaw, which meant that he started losing his teeth very early in his life for a donkey. Five years ago he was nicknamed “Henry One-Tooth” but his nickname changed to “Henry No-Teeth” just over 12 months ago. Having no teeth was not a problem for Henry. The sight of Henry jostling with Nobby to be the first OAP [old age pensioner] out into the paddocks will be remembered for a long time – at the age of 47, Henry could move like a sprinter if there was food waiting for him. Henry was also a regular attention seeker and tried everything to get that extra bit of fuss that all old donkeys deserve. Eighteen months ago, Henry looked sad and poorly; he was put on a drip and the sanctuary’s famous “Pyjama Club” of staff looked after him through the night. Henry had all his favourite sloppy foods in a “get well buffet”, and he sprung up like Lazarus to run into the fields 24 hours later. “Henry’s acquired taste wasn’t just related to food. He had a very clear idea about what his water should taste like and what temperature it should be! In the long winter of 2018, Henry looked a bit dehydrated. A quick visit from the vet and we all realised why … he refused to drink the very cold water!” A kettle was acquired to heat up Henry’s drinks. “We have repeatedly but gently, informed people that some of our donkeys are very old and will not be with us forever. We enjoy each day with them, live for the present and give them the very best quality of life that we can. 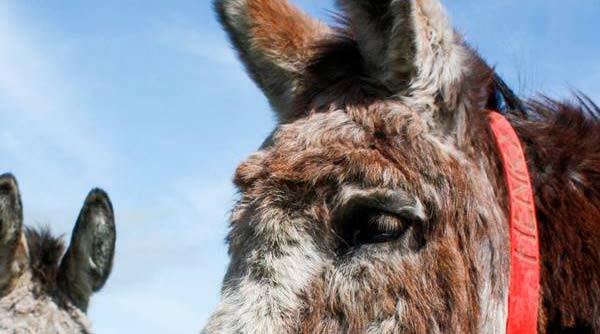 No donkey has ever had so much love conveyed on him as Henry did, and in return he sent visitors, supporters and holidaymakers away with a big smile on their faces,” the sanctuary said. He was beautiful. God bless for having him a long time.